- Host: Rob Greenlee, VP of Podcaster Relations of Voxnest that operates Spreaker. I am a 14+ year podcaster that started out on the radio. 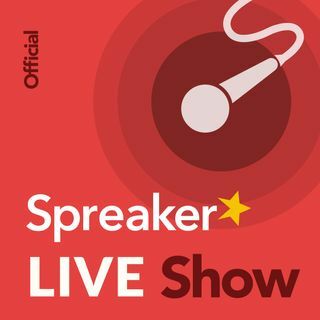 This is the official podcast of Spreaker platform. -If you want to send me an audio promo for your show, I would be happy to play it on the show. If you are wanting growing income from your show, you need to plan for that. Many choose to build audience first, then slowly get into advertising, keep in mind audience size is important to gaining revenue from advertising as is most of the time based on a CPM model or getting paid based on an increment of 1,000 download/plays of your show. Ad’s can be either baked in “Host Reads”, typically only available to large audience shows in the 10’s of thousands range. The other type is the monetization offered by Spreaker with every paid pro account utilizes Dynamic Ad Insertion and we do all the ad sales for you. You can enable Preroll, Midroll and Postroll Ads and it will just do it all for you and you get a revenue share on it. Just need to set your Midroll positions in each of your episodes. Coming up you are going to hear from four ladies from the Upright Citizens Brigade Theater in New York, Huffington Post, and Bleacher Report. Love the Epidemic Sound music, too! The best place I have ever found to license music. Your license will cover you for any music you use during your subscription for the life of your content even if you cancel your subscription in the future. NABShow.com - Las Vegas - April 6-11th, 2019, Voxnest and Spreaker will be there in force with a booth again this year. Jared, who hosts “The Fire Rescue Show” Podcast on Spreaker - Where we discuss Fire safety, Fire trucks, and the Equipment they carry – with your host Jared - 12 year old podcaster! Also agree with Alex on his comments on the 12 yr old podcaster building a network in readiness for when he becomes a fireman. I record the Wheel Fell Off with my 18 yr old son - who I've podcast with since he was 12 too. Part of the idea of that podcast is to put his name out there with the company who makes Football Manager - my son want's to go in to making video games, in particular Football Manager, havign a podcast about it is another thing he can put on his CV to help land his dream job. Totally agree on the advert bit. If I can cover my website costs per year (£30) I'd be happy. If not its no big deal. Oddly having ads gives listeners the impression you're podcast is bigger than it is - from the feedback I've had from my audience. Thank you for listening to the show. Thanks to all who contributed to the show today.. including those listening and commenting. Nice, Jared . . . unique and educational! Thanks Rob you’re probably right. No commenting and driving! You may have clicked to play an earlier episode in a different tab in your browser. I’m not concerned about advertising revenue at all. I just do it for the fun of it and for the love of it. I’m fortunate I’m able to afford my minimum set up thanks to SPREAKER! Lol. Listening live while driving and commenting is obviously a little difficult for me. Is that even possible? I was commenting as you sore me saying hello to you Linda and Jared me while I’m hearing Bob talk to Todd. I guess it’s possible! Sounds like your phone jumped to the previous episode. I may be out of my mind? I swear I was just listening to Rob talk to Todd about Spotify and podcast one and the next thing you know I’m hearing Alex on the show. Maybe it’s just my phone acting up? I listen to the replay. Todd is only on The New Media Show that is in the feed here. That show is done on Saturdays. That was Jared in the promo, right? Oye. I gotta listen to the replay. Jared's interview is later in the episode. Now I’m hearing Alex. Was Todd on the show earlier? I only heard Jared earlier and Alex now. Am I crazy or wad I just hearing Todd talking to Rob?